Have you left your Halloween decorating until the last minute this year? Never fear! There are plenty of simple decorations that you can put up before the hordes of trick-or-treaters come knocking for their candy on Friday night. And one part of your front porch is perfectly primed to serve as a base for some of your creepiest adornments: your awning! Read on to find out how to construct a haunting holiday display using your residential awning. An awning that covers your front porch or door provides you with an ideal spot from which to hang certain decorations. Try creating a massive spider web, either using window webbing from a craft store or simply string. You can anchor it at the corners of your awning to keep it from blowing away or getting knocked down. Attach a giant (and hopefully fake!) spider as a bone-chilling bonus! You can hang even more from your awning to complete your perfect Halloween look. 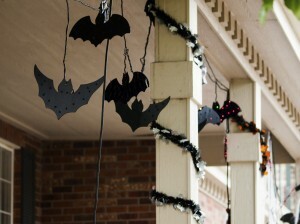 Cut out silhouettes of different spooky creatures, such as bats and bugs, and hole-punch them so that they can be strung up and dangled from the edge of your awning. You could even use your awning to hang twinkle lights- in holiday-appropriate orange, of course- to make your home really stand out on Halloween night! On your porch itself, make sure to display your jack-o-lanterns, scream-worthy scarecrows, and any other decoration you might want. With a little help from your awning, you’re sure to have the most unique house on the block for the trick-or-treaters to visit!